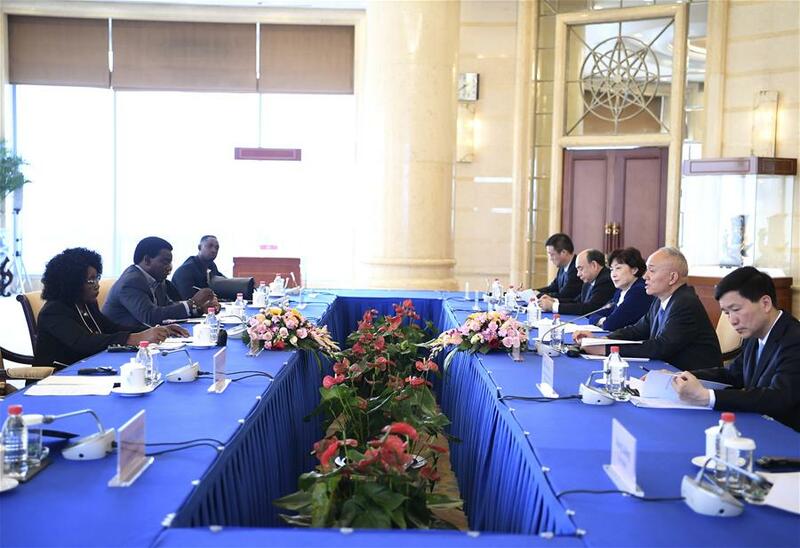 BEIJING, April 16 (Xinhua) -- Cai Qi, member of the Political Bureau of the Communist Party of China (CPC) Central Committee, met with a delegation led by Sophia Shaningwa, secretary general of Namibia South West Africa People's Organization (SWAPO) Monday in Beijing. Cai, also secretary of the CPC Beijing Municipal Committee, said the CPC stood ready to work with the SWAPO party to give full play to the strategic guidance of political parties in developing bilateral ties and to enhance experience exchanges in party building and state governance. Cai expressed hope that the two parties will transform their friendship into a driving force for the sustainable and healthy development of bilateral ties. For her part, Shaningwa said the SWAPO party expected to consolidate the fraternal friendship of the two parties and hoped to have an in-depth understanding and learning of the CPC governance philosophy.